Camelback Mountain sits firmly in the middle of the Phoenix Metro area and is bordered by Phoenix, Scottsdale and Paradise Valley. It’s central location and prominent shape make it incredibly enticing, attracting over 300,000 recreational visitors each year. Located on the north side of Camelback Mountain is a shallow cave, or grotto, where the ancient Hohokams practiced religious rituals. This fact, coupled with the mountain’s mystique have led some to refer to Camelback as the Sacred Mountain. During the late 1800s, the federal government reserved Camelback Mountain for an Indian reservation. By the 1940’s most of the land had fallen to private ownership. Gary Driggs, a local resident with a close association with the mountain, has fought to protect the mountain, successfully, since the early 1950’s. The area has been off-limits to developers since the mid 1968, thanks to Driggs and the Preservation of Camelback Mountain Foundation led by Barry Goldwater. A ceremony was held in 1968 in honor of the mountain’s preservation and was attended by President Johnson (the First Lady was said to have hiked Cholla Trail in high heals). The Phoenician, a world-famous resort built-in 1988, sits right at the south-eastern base of the mountain and it’s golf course wraps around to the north-east side near the trailhead. Camelback’s accessibility is what makes it so dangerous. Novice hikers, weekend warriors and clueless urbanites have all flocked, at one time or another, to the mountain in the middle of the city for an easy afternoon workout in the sun. Many of them come unprepared. Camelback is no walk in the park and for those who arrive with insufficient water, improper footwear and a lack of respect may find themselves on the evening news. Every year, rescue crews respond to dozens of calls of stranded, injured or missing hikers at Camelback Mountain. People think that because the trails are in the city that there is somehow less danger here. In the summer of 2009, rescue crews were called out to Camelback over a dozen times in a single day, most related to dehydration. Access to the Cholla Trail requires parking roadside on 64th Street just north of Camelback Road. This area fills up quick throughout the year so plan to add an extra couple of miles to your overall hike. The trailhead is located about a half-mile down Cholla Lane on the south side of the road. The beginning of the trail actually wraps around part of the Phoenician’s golf course. Then you start your climb, gradual at first, up rock steps and a narrow trail. At peak season much of this trail can be crowded forcing people to stop along the narrow path to let oncoming traffic by. Once the rocky trail crawls around to the first lookout, you are at the eastern-most point on the trail and it cuts back to the west towards the summit. Watch your footing through this area because even though the trail is well-worn and not technical, there is plenty of loose rock and uneven ground to twist an unsuspecting ankle. On much of this trail, a bad step could send you reeling down the mountain, other times it may just mean a bad fall into an angry cactus. The climb is consistently uphill, though not steep at this point. Not until you’ve reached the saddle, about halfway up, does the trail become technical. From the saddle, route finding is accomplished by following old painted blue dots on the occasional rock. Following the dots, you climb up the spine of the mountain. “Spine” is a good description of this ridge-line since it’s mostly jagged, broken granite jutting into the sky like vertebrae. This portion of the hike is especially dangerous and I’ve known many hikers who have turned back. If you suffer from even a marginal fear of heights, the trail to the summit can be too much. If you’ve never done the hike before, the summit sort of sneaks up on you. You’ve made climb after climb thinking “this is it!” only to see more climbing before you. Then all of a sudden, there you are…with everyone else! The Echo Canyon Trail also reaches the summit (from the west side) and you often find yourself on a very busy, crowded, chat-filled rock wondering where all these wheezing, sweat-soaked people came from. The crowd is usually pretty eclectic. Being in the middle of the city, you’ll have people in business clothes, Yoga gear, shorts, jeans, bathing suits and, yes, even in their underwear. All tired, sweaty and happy to have reached the top in one piece. I usually sit at the top for at least a few minutes, check my time, maybe take a picture or two and just enjoy the view. The summit offers some amazing 360 degree views of the Phoenix area. Timing your hike to be able to see a sunrise, or sunset from the mountain is a must in my book. Whenever you hike it though, be sure you come prepared, have respect for the dangers on this mountain and try to leave it just the way you found it. Cholla Trail at Camelback Mountain. No trailhead parking. Street parking limited at Invergordon and 64th Street. Hikers must walk up the south side of Cholla Lane. Cholla Trail is only recommended for experienced hikers and has steep, rocky sections with drop-offs on both sides of the trail. Powered by Breadcrumbs: manage, edit and share GPS tracks for free. Hiking and backpacking is fantastic exercise. For many, though, it’s also an opportunity for injury. Hiking over the rugged, uneven terrain we love puts specific strain on the tendons and joints in our legs, causes muscle fatigue and forces a forward leaning posture that is very hard on the long muscles of the back. The additional challenge of carrying weight in a backpack magnifies our potential for injury. Creating an even bigger problem, many of us have day jobs that keep us bound to an office chair staring at a computer screen. This combination of sedentary work mixed with active outdoor pursuits can lead to torn muscles, strained tendons, and pinched nerves. With a little off-trail conditioning and post-hike stretching using basic Yoga movements, we can reduce our risk of an injury that can force us off the trail for good. Yoga has, in one form or another, been around for over 5,000 years. Believed to have been introduced to the West in the 1800’s, it’s gained popularity in recent decades as a way to improve overall health, sharpen mental focus and reduce stress. Of the 8 steps attributed to Classical Yoga typically physical exercise (asana), breathing techniques (pranayama) and meditation (pratyahara) are the general focus of Modern Western Yoga. Yoga has been proven to increase physical strength, build stamina and improve cardio-vascular health. The combination of slow, focused movements and controlled breathing allows us to exercise systems in the body that don’t otherwise see much action. 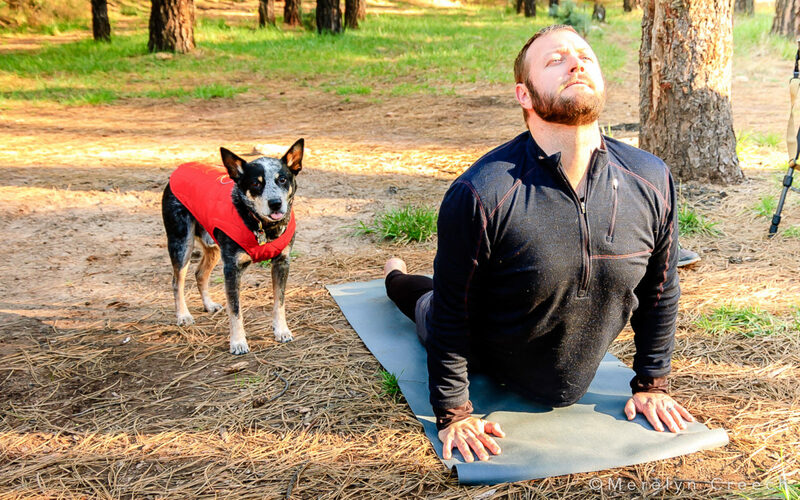 For all active people, but hikers and backpackers specifically, Yoga offers a great way to maintain the strength we need for the climb, while also improving balance, flexibility and recovery time. Starting in January, I will make Yoga Practice for Hiking a regular part of my Blog. I will be introducing new forms and movements with step by step instructions, explanations and some tips and tricks. I’d also like to include some pictures and video for reference but that part may have to wait. For those of you who are new to Yoga, I will go over some of the basics here to get us started. Anyplace where it is quiet and without distraction. I like to have my morning stretch in the backyard on the patio. I get up early and start my morning coffee, while it’s brewing I take a few minutes to go outside and stretch. Warming up my muscles, soaking up the morning sun, breathing in the crisp morning air while I wait for my coffee is the perfect way to wake up. For post-hike stretching, a quiet trailhead or parking lot or even an open picnic area is all you need. As I mentioned, I like to stretch in the morning when I get up. I also try to stretch a few times throughout the say because I spend my days working behind a desk. So, for me, whenever I start to feel my muscles stiffen up or my back or neck start to ache, it’s a good time to stretch. It’s also recommended a good stretch after any extensive exercise. You really don’t need anything special. I have a very basic Yoga Mat, I make sure I have loose comfortable clothes that won’t restrict movement and a towel. Other than that, all you really need is a distraction free location, time to complete the routine and a plan. Very simply put, Yoga will improve performance and reduce the potential for injury. Athletes at all levels of competition have experienced increased performance with the addition of Yoga to their training regiment. I’m really going to try to make sure I explain the process clearly. The rest is practice. The important thing is being aware of your body and paying attention to how you feel. If something hurts, or doesn’t feel right…stop. Focus on breathing through the movements and transition slowly from one position to another. Practicing slow, deliberate movements while keeping your core tight and your breathing controlled will allow us to get the most out of every exercise. If you follow along with me, we are learning together. I have some experience with Yoga and have taken several classes, followed a few video workouts and have done a fair amount of research on the subject. I am, by no means, an expert. I plan to pursue this subject as a learning process and will be consulting with experienced Yogi’s, Yoga instructors and instructional books to determine which movements and combinations will have the greatest advantage to hikers and backpackers. I want to try to provide suggestions for basic everyday routines, post-hike routines as well as therapeutic exercises for when injuries do happen. If you have any specific problem areas or post-hike discomfort, let me know so we can look for a way to work through it.